How many emails did you send this month? How many web searches you made on Google? Which country location you logged into Google account to use various Google services? You can get answer to all these questions using new Google account service aptly called “Google Account Activity”. Once this feature is activated, you should receive monthly (password protected) report showing details of Google account usage across various Google services like Gmail, Youtube, Latitude and so on. 1. Open Account Activity webpage and login into your Google account (if not already logged in). You should see ‘Opt in’ box (as seen in screenshot below). Confirm your email address and country time-zone – then click Opt in button to activate your ‘Google Account Activity’ reports. 1. Your online activity can be easily managed and organized through such reports feature. If you have spent more time emailing and searching web as compared to last month – you can cut down on the same (in case you are planning to restrict time spent online). 2. Account security can be analysed by checking account login information by country and devices. If you notice country or device listing not actually used by you – you can recheck password and account recovery steps for better account security. 3. Quick insights provided by ‘Google Account Activity’ reports should find many takers, for examples – did you sent and received more emails this month? More such insights can be easily had through activity reports feature. Thanks for sharing this information. 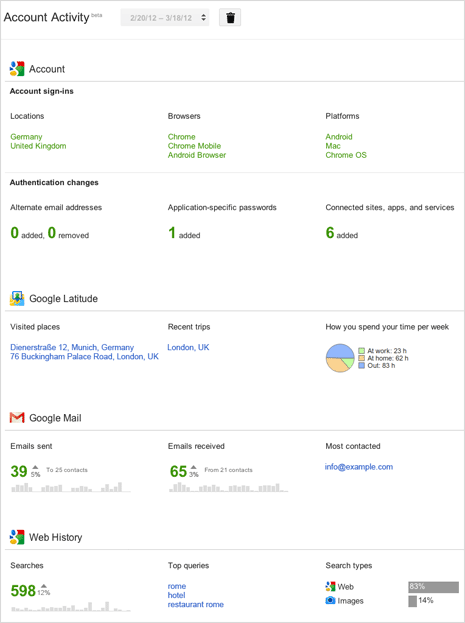 I have activated google accout activity report feature for my gmail account. Please tell me how to deactivate this.